BISMARCK, N.D. (AP) North Dakota officials will dedicate about $1.6 million this year to stabilize collapsing underground coal mines in the central and western parts of the state. The North Dakota Public Service Commission funds come from the Abandoned Mine Land program, which is funded through a federal tax on coal, The Bismarck Tribune reported. The program aims to eliminate public hazards from mining-affected areas. The federal dollars pay for staff positions at the Public Service Commission to run the program, contractors and temporary inspectors hired to oversee projects. But the program's long-term future is uncertain with the tax's authorization set to expire after 2021. Commission Chairman Randy Christmann said the state received $2.8 million this year to keep up with reclaiming hazardous abandoned mines. That amount is less than the $3 million the state expected due to sequestration. “The reality is we face the potential end of this program,” Christmann said. Christmann said he hopes the federal program is reauthorized and the funds aren't diverted to other priorities. Bill Dodd is the assistant director of North Dakota's Abandoned Mine Lands program. He said he anticipates the state's inventory of projects to continue beyond 2021. “We think that we could spend at least another $40 million on high-priority abandoned mine land reclamation, if we had that money,” Dodd said. Contractors in Burleigh County are continuing to stabilize underground coal mines along North Dakota State Highway 36 near Wilton. Work on the area began in 2015. Dodd said the underground mines were active about 100 years ago. 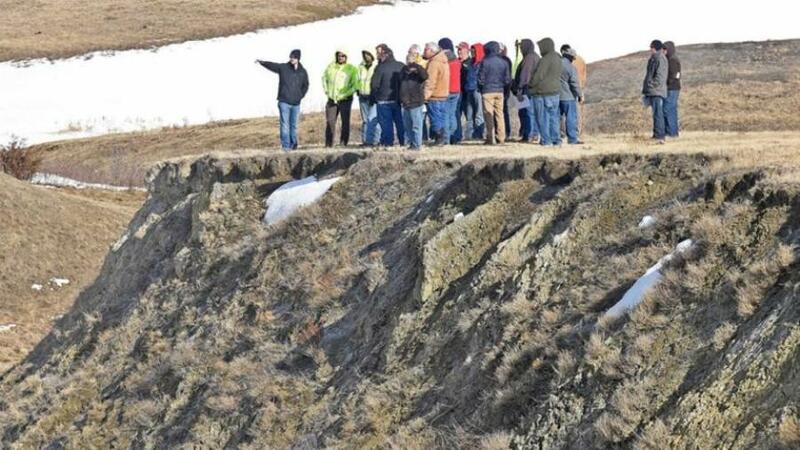 North Dakota prioritizes projects that have the greatest risk of causing harm. “Someone could be killed or injured badly, just instantly,” Christmann said. Work to eliminate the voids involves drilling into the workings of the mine and pumping pressurized grout. Christmann said sinkholes could develop more frequently as the abandoned mines continue to age. “Every year, these old mine shafts are another year older,” Christmann said.